ScannerCast is the official Broadcastify Live Audio customized software package designed for easy setup and streaming of your feed. Open (double click) the .zip file. Copy all files from the .zip file to the directory you created in step 1 above. Note that you need to COPY (drag and drop) the files from the .zip file to the directory created in step 1. Do not just click ScannerCast.exe from within the downloaded .zip file. To start ScannerCast, double click the “ScannerCast.exe” icon in the directory you created in step 1 -- This file will have a black and white speaker icon to the left of the file name. Set parameters on the ScannerCast "Config" tab as indicated below. If you are planning on sending alpha tags in your broadcast, choose the supported scanner model. If your scanner model is not listed or you do not plan to send alpha tags, choose "Audio Only." If you are sending alpha tags, select the COM port the scanner is using, com port speed and desired tag format. Enter your RR user name and password. Click "Login To RR and Get Config". Select your feed from the "Feed to Send" pull down menu. Use the Status tab to check the status of your feed. Choose “Stereo” if running a stereo (Left & Right) feed from two scanners. Bit rate is automatically selected. Before you can run ScannerCast, you need to have the Microsoft .NET Framework V2.0 (or later) installed on your computer. Vista or Windows 7 will already have the .NET Framework installed so you do not need to do anything. This special edition of ScannerCast for Radio Reference Live Audio is supported on systems running Windows 2000 or later. ScannerCast has been tested and is known to work on Windows 2000, Windows XP (32-bit and 64-bit), Windows XP Embedded, Windows Server 2003 (32-bit and 64-bit), Windows Vista (32-bit and 64-bit), and Windows 7 (32-bit and 64-bit) systems. Once you select the feed to stream, ScannerCast will automatically load all the needed information from your feed page. This includes your feed description. You are not able to modify your feed description via this special RR edition of ScannerCast. Use the help tab on your feed owner's page to request changes be made to your RR Live Audio feed. We will try to honor your request, but we will be the final judge as to the feed description. We need to maintain a standard so requests like “Change my feed description to Bob’s Scanner feed” will not be approved. You may have to allow ScannerCast through your firewall. 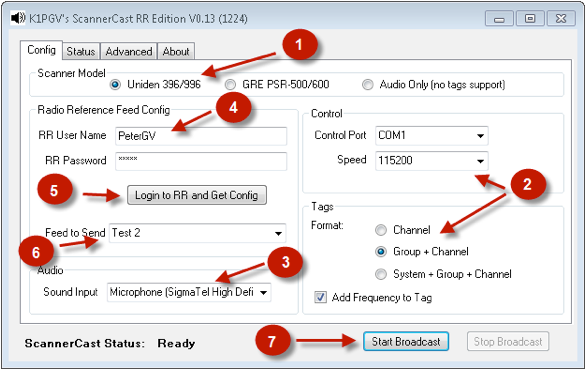 See the RR Live Audio Wiki on alternate streaming ports. Please also refer to Setting Up Your Broadcasting Station for information on connecting your radio and computer to broadcast your feed and to set the proper audio level from your scanner to the streaming computer for the best clear sound. Take a minute to review the instructions on this page. Even though ScannerCast is relatively easy to setup, it’s important to follow the instructions carefully. Check the ScannerCast Setup FAQ here in the WIKI (http://wiki.radioreference.com/index.php/ScannerCast_Setup_Instructions) – This is where you’ll find answers to the most common questions or problems that people have about getting ScannerCast setup correctly and their feed online. Post your problems/question in the Live Audio Administration forum (http://forums.radioreference.com/live-audio-administration/) -- The RR Audio Admins monitor this forum and are ready to assist you on a time available bases.